Every week we pull together some great Canadian recipes from food bloggers around the web featuring one main ingredient or dish. Keep things frosty this weekend with 15 creative popsicle ideas! When the temperature rises and you want to keep the kids (and the kids at heart) cool, popsicles fit the bill. Not only are the flavour possibilities endless, but they're just flat out fun! So here you have it - 15 popsicle ideas with everything from breakfast popsicles (popsicles for breakfast?? YES!) to healthy popsicles and some decadent popsicles. Whatever the occasion... stay cool my friends! 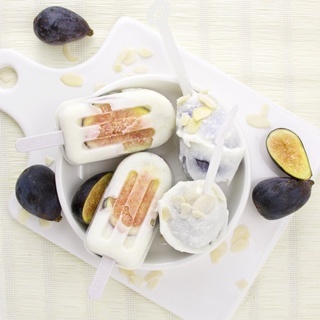 **[Fig, honey and goat cheese popsicles](https://thefoodolic.com/2016/07/27/fig-honey-and-goat-cheese-popsicles/)** from **The FoodOlic**. **[Creamy Earl Grey Popsicles with Grass Jelly](http://cococakeland.com/recipes/creamy-earl-grey-popsicles-grass-jelly/)** from **Coco Cake Land**. **[Strawberry Cucumber Popsicles](http://eatingniagara.com/2014/09/the-last-hurrah/)** from **Eating Niagara**. **[Creamy Chocolate Popsicles](http://www.fridaycakenight.com/2014/07/creamy-chocolate-popsicles/)** from **Friday is Cake Night**. **[Mango Orange Popsicles](http://www.chocolateandchillies.com/2015/06/mango-orange-popsicles.html)** from **Chocolate & Chillies**. **[Panna Cotta Popsicles](http://www.bhawishkitchen.com/2016/07/panna-cotta-popsicles.html)** from **Bhawish's Kitchen**. **[Toasted Coconut Fudgsicles](http://www.simplystacie.net/2016/07/toasted-coconut-fudgsicles/)** from **Simply Stacie**. **[Cherry Garcia Popsicles](https://veggiezest.com/2016/07/14/cherry-garcia-popsicle/)** from **Veggie Zest**. [Dreamy Peanut Butter, Banana & Chocolate Popsicles](http://www.occasionallyeggs.com/2016/06/dreamy-peanut-butter-banana-chocolate.html) from **Occasionally Eggs**. **[Berry Beer & Lime Popsicles](http://www.culinary-cool.com/berry-beer-and-lime-popsicles/)** from **Culinary Cool**. **[Strawberry Coconut Greek Yogurt Popsicles](http://www.theoliveblogger.com/recipes/strawberry-coconut-greek-yogurt-popsicle/)** from **The Olive Blogger**. **[Golden Kiwi Pina Colada Popsicles](http://justinecelina.com/golden-kiwi-pina-colada-popsicles/)** from** Justine Celina**. **[Yogurt Parfait Breakfast Popsicles](http://foodwhine.com/2015/09/yogurt-parfait-breakfast-popsicles.html)** from **Food & Whine**. **[Iced Coffee Popsicles](https://tinysweettooth.com/2016/07/27/coffee-popsicles/)** from **Tiny Sweet Tooth**. **[Strawberry Yogurt Canada Pops](https://bluenosebaker.wordpress.com/2015/06/28/strawberry-yogurt-popsicles-for-canada-day/)** - perfect for cheering on Canadian athletes at the Olympics - from **Bluenose Baker**. Thanks for all the great ways to cool down! These all look so incredibly yummy! Can’t wait to up my popsicle game! !